Masters 2013: Is Tiger Woods ready to reign again? Back at world number one for the first time since October 2010 and hot favourite to win his fifth Green Jacket at the Masters this week. The 37-year-old has certainly been in impressive form, winning three times in four strokeplay events this year, and six times in his last 20 starts on the PGA Tour. So is this the start of a new period of dominance for a player who was the game's eminent force for more than a decade? And can the Masters kick-start the American's quest to break Jack Nicklaus's record of 18 majors? After all, he has been stuck on 14 major titles since 2008, derailed by scandal, injury and struggles with a new swing. How has his game changed since those halcyon days of a decade ago, and can he become even better than he was back then? Woods has been working with Canadian Sean Foley since 2010 following the departure of long-term coach Hank Haney, with whom he won six majors. At times Woods has struggled with Foley's concept, most notably at the Masters last year, when he appeared to fight the swing and struggled home in a tie for 40th, his worst finish as a pro at Augusta. Now he appears comfortable with what he is doing and the results show it. "Foley has got his arms working a lot more up and down whereas Haney had the swing working around him more, like Ben Hogan," says Tour coach Jonathan Yarwood. "The techniques are quite juxtaposed. Foley is trying to use the body through impact to reduce hand action and achieve more consistency. It's working well with his irons but with the driver it is still a work in progress." Driving - accuracy, rather than length - has always been Woods' nemesis. It's easy to get bogged down in statistics, but since he won his first major in 1997, he has only featured in the top 100 in driving accuracy stats five times (1997, 1999, 2000, 2009, 2012). Even then, 53rd last year was his highest position. After his latest Bay Hill win he was ranked 142nd. With his irons he has made substantial progress since 2010, according to the statistics for greens in regulation (hitting every green to allow two putts for par). But he is yet to reach the heights of the Haney or Butch Harmon (Woods's coach from 1993-2004) eras, when he regularly topped the rankings in this category. "The golf swing is like a painting that never gets finished," said Yarwood. "They are always refining, tweaking, adding little brush strokes. Woods is the Picasso of golf, and a little brushstroke here and there can make an enormous difference. "Tiger's got a little too technical at times but he's started to come out of that and is starting to flow." Woods agrees. "I'm very pleased that some of the shots that I struggled with last year are now strengths," he said. "My good ones are really good. It's just making sure the bad ones aren't that bad. I can still continue to improve and clean up my short game. I don't want to become as good as I once was. I want to become better." "This year his creativity with shot-making has returned in a way that I haven't seen since 2009," said international golf journalist and seasoned Woods watcher Robert Lusetich. "But he's better than he was then because under Haney, Tiger feared the big miss to the left, so he became more and more defensive with the driver, sort of bunting shots out to the right. He hits it now much straighter and much longer. "What he had with Haney was distance control and that's now where he's getting to with Foley. Once he has distances dialled in, he's hard to beat, especially because his putting is off-the-charts." In his glory days, Woods was one of the hottest putters ever to play the game. Time and again he would drain key putts, not only for birdies but to save crucial pars. The sight of a Woods fist-pump as another bomb disappeared from view became legendary. In the last few years, the focus on his long game has impacted on his putting and short game. But a 45-minute putting lesson from his Ryder Cup and Presidents Cup team-mate Steve Stricker at Doral seems to have been the turning point. Stricker played down the significance of their session but admitted Woods left in high spirits and went on to win the tournament, following it up with victory at Bay Hill on his next outing. Woods now tops the overall putting statistics, compared to 28th at the end of last year. "There were just some set-up issues," said Stricker. "He got into some poor positions. I've watched him over the years I know his stroke and just tried to get him back into the positions that he is usually in." Lusetich said: "The thing that separated Tiger for many years, and allowed him to win tournaments with his "B" game was the fact he canned so many 20 footers. If he leads the field in putting, it's game over." Injuries have played a key role in the Tiger Woods story and shaped the way he swings the club and how much he has been able to practise. He won his last major while suffering from a double stress fracture of the left leg and knee ligament damage, and immediately took eight months off for reconstructive surgery, his fourth operation on the same knee. Woods also missed the 2011 US Open and Open because of further left knee and Achilles tendon problems suffered when he hit a shot out of the pine straw at Augusta that April. He was still being plagued by the Achilles in early 2012. "If I get healthy, I know I can play this game at a high level," said Woods after his win at Bay Hill. "I know I can be where I'm contending in every event, contending in major championships and being consistent day in and day out. That was the first step in the process. Once I got there, then my game turned." 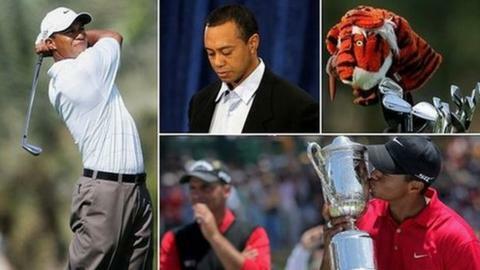 Veteran US golfer writer Doug Ferguson of the Associated Press said: "If you look back, his health was big part of it. He couldn't work as much as he used to. When he finished his second round at Bay Hill he went straight to the range and stayed there for an hour and a half. That's the sort of thing he couldn't do from late 2010 onwards." Now, though, he is playing injury free and that has played a key part in his rise back to the top of the rankings. Much has happened to Woods since that fateful night when he crashed his car and the details spilled forth about his extra-curricular activities. But the talk from the Tour is that he is now a much happier individual. Clearly winning helps, but after divorce in the summer of 2010, Woods has a new love interest in US ski star Lindsey Vonn. When quizzed about the link between a new squeeze and an upsurge in form, Woods grinned and said: "You're reading way too much into this." The old Tiger would have stonewalled. "He just seems in a better place, mentally, to me," said Stricker. "I don't really know too much about his personal life, but it just seems like he's happier, a little more at peace or at ease with himself. He seems to be having fun, to have a lot of confidence in himself and his game. "I think he learned a lot from a couple of years ago - be more cordial to everybody, respect other people. He is happier with himself, you can see it. Just the way he is treating people is better. It looks like he is working hard at it." "There is no question in my mind Tiger took a very big hit to his confidence," said Lusetich, author of "Unplayable", an account of Woods's tumultuous 2009 season which ended in scandal. "I'm not sure he believed in himself after being exposed and I think he was deeply embarrassed. Other athletes have been through similar things - probably not of the same magnitude - and they've rebounded because they've answered on the field of play. It's been a very awkward time for him but he seems to have healed those wounds. "That's obviously a huge part of the answer as to why Tiger's back. The turmoil has been replaced and there is stability. He's had a couple of years to get used to being a divorced parent of two young children. He and his ex-wife have figured out how to make that work and he obviously has this new relationship. I don't think it's coincidental you play well when you're happy in your life and that's where we see him now. " Woods's life's work is all about winning majors and he won't be properly back until he lands a big one again. Since his last major title in 2008 he has had seven top sixes in the 14 majors he has played. At Augusta, barring last year, Woods has not been out of the top six since winning his fourth Green Jacket in 2005. But while he might look nailed on for the Masters this week, remember we were here last year with Woods going to Augusta as Bay Hill champion. Instead, he failed to break par all week and cut a frustrated figure, even kicking his club in temper at one stage. He won before last year's US Open at Olympic Club, too, but squandered a share of the 36-hole lead to slide back. And he went close without really threatening on the final day of the Open at Royal Lytham, ending tied third. "I don't want to diminish what he's achieved - six wins in his last 20 tournaments - but they have all come on courses where he's done well in the past," said BBC golf correspondent Iain Carter. "The acid test will come in how he plays in the first major of year." Woods insists all the sign posts are in place. "Throughout my career when I've changed my game you can see the incremental progress I've made," he said. "You've got to be able to do it at home first. Then it is being able to do it Thursday, Friday and maybe a Saturday afternoon - and then ultimately down the stretch on Sunday. Then you've got to do it in a major. "That process has been evolving and you can see the stepping stones. Then eventually I get to a point where I start winning golf tournaments." Woods now has 77 PGA Tour wins to his name, including 14 wins from 60 majors as a pro. Nicklaus was also poised on 14 majors from 60 at the age of 37 and clinched his last aged 46 in 1986. Former Tour pro and one of Woods' long-time friends, Notah Begay, said: "He is focused on 20 majors. That may be a little hard to believe, considering what has transpired in the last three years, but that's where his focus is. He thinks he is capable of winning 20." And Nicklaus himself recently said: "I still think he'll break my record. Tiger's talent, at 37 - it's not that old. I won four after that. But that said, he has still got to do it. He had better get on with it if he's going to."